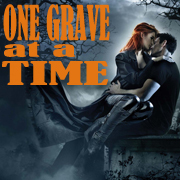 Just in time to celebrate the release, our very own Trader just posted a fantastic review of One Grave at a Time on Greenabsynthia’s Book Blog. Excerpt: Jeaniene Frost does it again with an action-packed sixth installment of her Night Huntress series. In One Grave at a Time, Cat returns to her roots and takes on a supernatural killer of an unusual kind, continuing the ghost theme introduced in This Side of the Grave. With Bones at her side and some help from their friends, they go after one of the more brutal villains in the series so far. Great review Trader! Be sure to visit Greenabsynthia’s Book Blog to read Trader’s review in its entirety. One Grave at a Time releases Tuesday, August 30th!